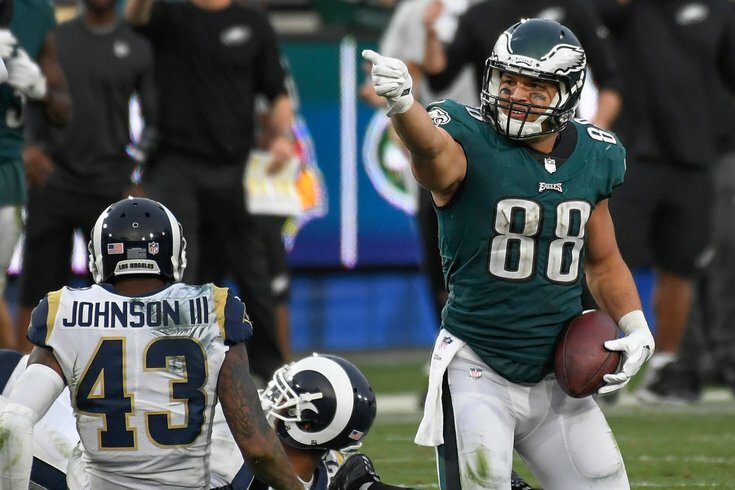 The Eagles are likely to receive a fourth-round compensatory pick for losing Trey Burton in free agency. Before we go down the compensatory pick nerd hole, let's just do a quick update on some of the Philadelphia Eagles' free agents' visits around the league with other teams, since they are relevant to the compensatory pick discussion, shall we? OK, we shall. According to Adam Schefter of ESPN, with interesting wording here, Blount will be visiting the Detroit Lions. Eagles’ free-agent RB LeGarrette Blount will be the last of four free-agent RBs this week to visit Detroit, where he will be Friday. Lions’ HC Matt Patricia is a Blount admirer. Blount's market is hotter in 2018 than it was in 2017, when the Eagles scooped him up in May. It feels very unlikely that Blount will be returning to Philly this season. Celek is also visiting the Lions, per Adam Schefter. Former #Eagles TE Brent Celek is visiting the #Lions today. The Eagles released Celek earlier this week, so he won't count toward the compensatory pick formula. Sturgis visited the Seahawks on Thursday and is visiting the Chargers today, according to Eric Williams of ESPN. If the Eagles lose more free agents than they gain this offseason, which something that hasn't happened in a half decade, then they will likely be awarded compensatory picks in the 2019 NFL Draft. If you'd like a more thorough explanation of the mechanics of compensatory picks, please go here, but the basics are that each player signed in free agency cancels out a player lost, and the round of the pick awarded is primarily determined by the annual value of the contract signed. So far the Eagles have lost three players in free agency – TE Trey Burton, DT Beau Allen, and CB Patrick Robinson. They have signed two players in free agency – DT Haloti Ngata and LB Corey Nelson. Currently, the Eagles are only in line to receive a compensatory pick for Burton, but it would be a good one, in the fourth round. If Blount and Sturgis can garner contracts big enough to at least count for seventh-round compensatory picks, then they would cancel out Ngata and Nelson instead of Allen and Robinson, because their contracts are likely to be more in line with what Ngata and Nelson earned. That would mean that the Eagles would be on track to gain a pair of sixth-round picks for Allen and Robinson, in addition to the fourth-round pick they currently stand to gain for Burton. Got it? OK, good. Anyway, just something to consider as players either join or leave the Eagles.